Directions: Choose the best answer. Answer ALL questions (or only a few at a time), then use the BUTTON at the BOTTOM of the page to check your answers. If you are told that an answer is incorrect, go back and redo that question and CHECK ANSWERS again. You may CHECK ANSWERS at any time. You may use your graphing calculator when working on these problems. 1. Which choice represents the solution(s) to the equation (x - 4)2 = 3x - 12 ? 2. Which choice is equivalent to ? 3. Which expression is NOT equivalent to 32x + 28y ? 4. At which point does the function y = -x2 + 6x - 5 reach its maximum value? 5. Which table represents a linear relationship? 6. The slope of a line is ½ and the y-intercept is 4. Which choice is the x-intercept of this line? 7. For which function defined by a polynomial, are the zeros of the polynomial -2 and -7? 8. Let x and y be numbers such that 0 < x < y < 1, and let d = x - y. Which graph could represent the location of d on the number line? 9. If h (x) = 2x2 + 3x + 1, find h (-2). 10. In the diagram at the right, the dimensions of the large rectangle are (3x - 1) by (3x + 7) units. The dimensions of the cut-out rectangle are x by 2x + 5 units. Which choice expresses the area of the shaded region, in square units? 11. Given y = 2x2 - 10x. Find all real values of x for which y = -3. 12. Given the equations 2x + y = 1 and y = x + 7. Find the value of x - y. 13. A sequence is defined recursively by: f (1) = 4; f (n) = f (n-1) + 3n. Find f (5). 15. A two-way frequency table is shown at the right. What is the marginal relative frequency of the number of students ages 14-17 ? 16. Which graph represents the function on the interval ? 17. What is the average rate of change between f (1) and f (5) in the function f (x) = x2 - x - 6 ? 19. Which ordered pair is not in the solution set of the system y < 2x + 4 and y > (½)x - 3 ? 20. The volume of a cone is , where r is the radius and h is the height. Which formula may be used to find the height? 21. Function g (x) is defined as: . Find g(-2). 22. A model rocket is launched vertically from a platform 64 feet above the ground. The height the rocket reaches during the flight is modeled by the equation s(t) = -16t2 + 48t + 64, where s is the height of the rocket and t is the time in seconds since the launch. After how many seconds will the rocket hit the ground? 23. 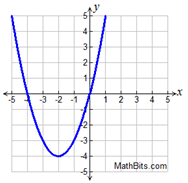 What is the range of the function y = | x | - 3 ? 24. Which of the following statements is true regarding the parabolic graph at the right?